Picture it. Your laptop has just been stolen. A week later, charges are appearing on your credit card for items you never bought. Your friends are getting strange emails from your email account. One friend opened an email from you at work and infected her company’s IT system. It cost her company a loss of 2 full day’s work until they got their IT system back up and running, and they aren’t too happy with your friend. A few months later you find out that you have a bad credit rating, somebody had obtained a bank loan and a credit card using your identity and hadn’t paid it back. But how had they found out your personal details? Think again about how much sensitive information you have stored on your laptop or device and what a criminal can do with that information. Now consider encryption. Encrypting your laptop means all of the data on your laptop is scrambled or unreadable unless you enter your encryption password. This encryption password (also known as a “key”) is not the same as your log in password. Now if your laptop is stolen, the thief can’t access any information on your laptop. Many large organisations have compliance regulations and legal requirements that state that your devices must be encrypted so from a business perspective, if you work with these organisations ensure that your devices are encrypted if you’re legally required to do so. Encryption software is free but the process can be long and often not user-friendly for non-technical users. 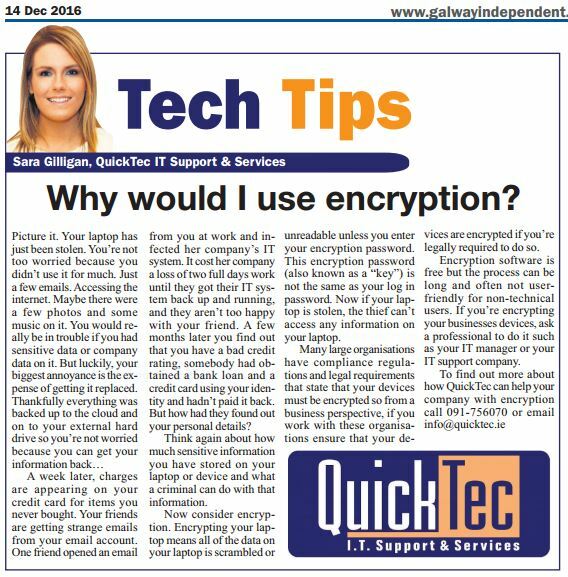 If you’re encrypting your businesses devices, ask a professional to do it such as your IT Manager or your IT Support company.